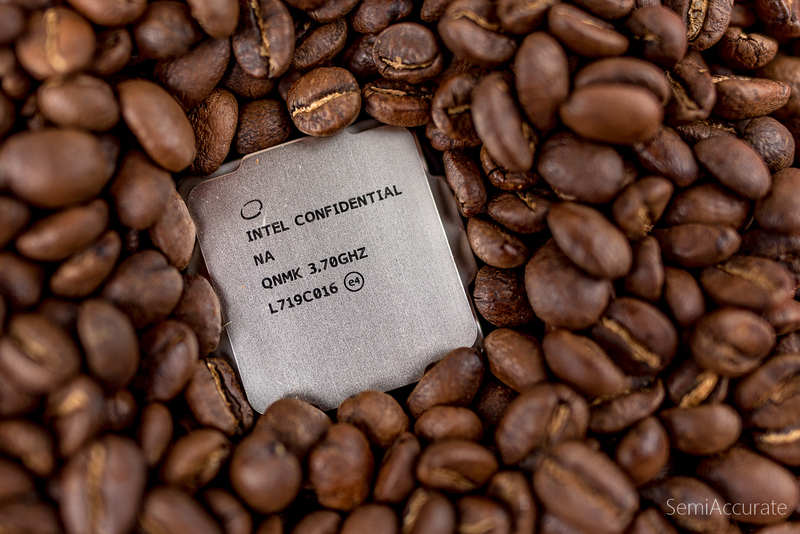 Today Intel is bringing the first chip based on its Coffee Lake architecture to market with the Core i7-8700K. In this article we’ll sample this new cup of joe from the big blue chip maker and see if it suits our palette any better than the alternatives. The Core i7-8700K is a hyper-threaded 6 core chip with a base clockspeed of 3.7 Ghz and Turbo states that go all the way up to 4.7 Ghz. It also offers 12 MBs of cache, support for DDR4 at 2666Mhz, and the latest generation of on-die graphics dubbed Intel UHD Graphics 630. Intel expects this chip to retail for a cool $360 which puts it nearly dead center between AMD’s 8 core Ryzen chips the 1700X and 1800X at $300 and $400. We won’t be covering the graphics portion of Coffee Lake in this article, but given the importance of this we intend to replicate the depth of our Ivy Bridge graphics coverage shortly. If you want to know more about the other chips in the 8th Generation of Intel Core product stack check out Charlie’s run down. Let’s start this review by seeing how the i7-8700K lines up against Intel’s 8 core Skylake-X part the i7-7820X which is positioned in the next tier up at $575 inside of Intel’s pricing stack. 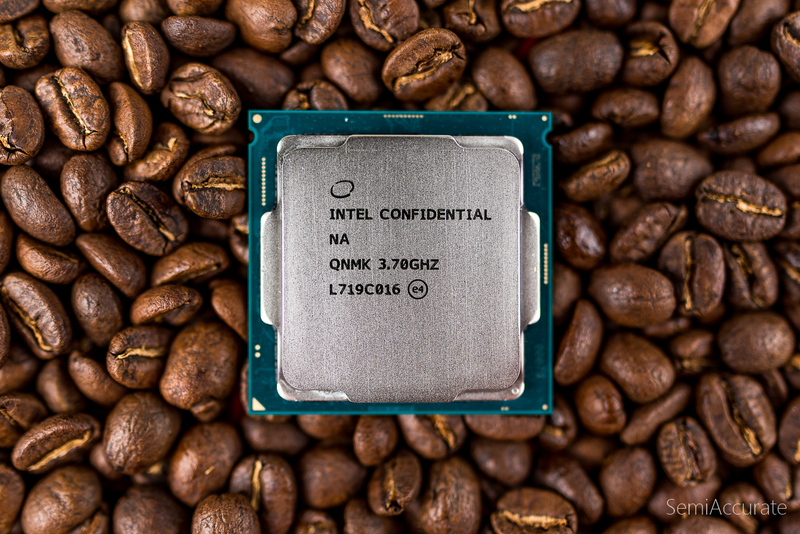 Coffee Lake performs well in our single-threaded testing and particularly in our web-based testing where it outperforms our Skylake-X chip by about 10 percent. Unsurprisingly Intel’s i7-7820X pulls ahead thanks to the 2 core advantage it has over the i7-8700K in our multi-threaded tests but it’s only a 15 percent advantage; this is smaller than we’d expect given the significant difference in core counts. In gaming Skylake-X and Coffee Lake provide similar performance with Coffeelake offering a small but consistent lead across the board. Power consumption clearly favors Intel’s new Coffeelake chip where it draws about 25 percent less power than Skylake-X and offers about 25 percent better performance per watt. The most impressive improvement is in idle power consumption where Coffeelake draws 30 percent less power than the already rather efficient Skylake-X. But how does Intel’s top Coffeelake 6 core chip fare against it’s cheaper, and hyperthread-less i5 branded sibling? 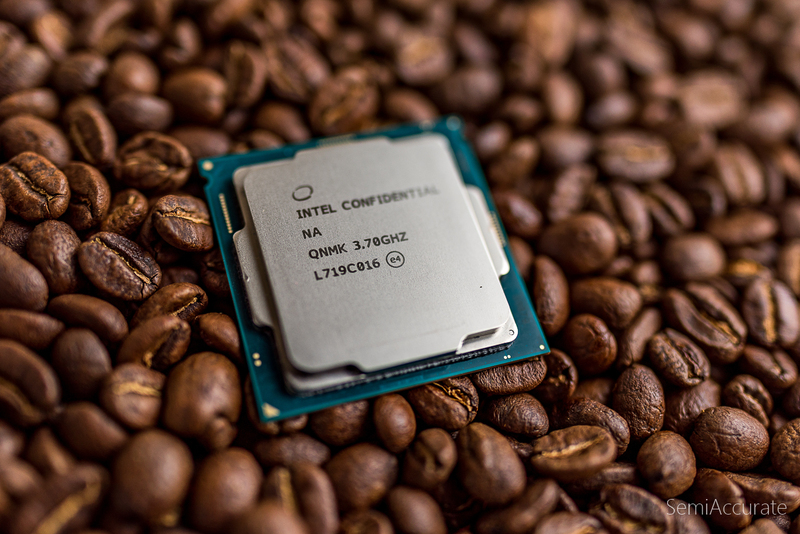 Both single threaded and multithreaded performance take solid 15 percent and 30 percent hits as we move from Coffee Lake i7 to Coffee Lake i5. 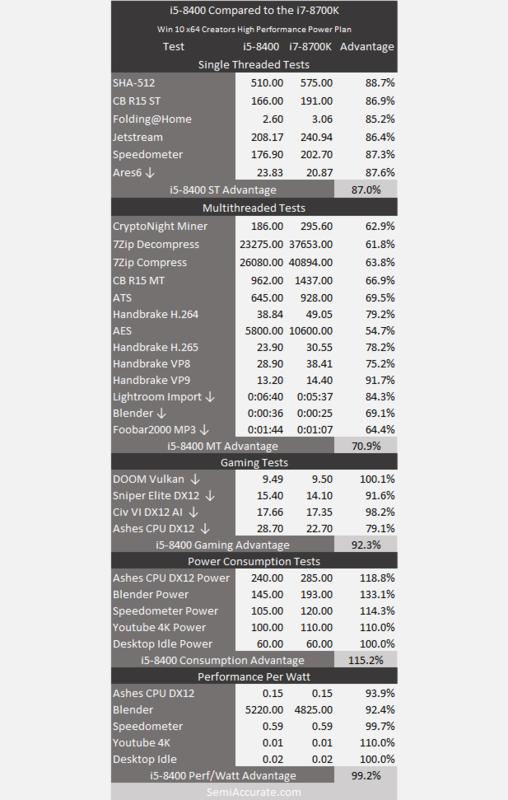 Gaming performance also takes a 10 percent hit, while raw power consumption declines by 15 percent. Performance per watt remains nearly the same as we move from the high-performance i7 to the mid-range i5. In this case raw core counts appear to have been rather misleading as there’s a bigger performance gap between the i5-8400 and the i7-8700K, which have the same core count, than there is between the i7-8700K and the i7-7820X which have 33% difference in core count. Coffelake is Intel’s second attempt at a counter to AMD’s high-core count Ryzen parts. The first attempt being the low-end Skylake-X parts which offered stiff competition thanks to their extremely aggressive turbo boost modes. Let’s see if try number two can put AMD’s Ryzen flavored revolution squarely in its place. As it turns out the results are pretty similar to what we saw at the beginning of the year. Intel maintains a single-threaded performance advantage, trades blows in multi-threaded performance while losing on the balance, offers a small advantage in gaming, and lower raw power consumption. The one performance per watt test where Ryzen has traditionally outperformed Core, Blender, is now a small efficiency win for Coffeelake thanks to the i7-8700K identical performance and slightly lower average power consumption. The specific of this race have changed, but the big picture appears to be about the same. Let’s hope that AMD’s Pinnacle Ridge can raise the bar even further. Coffeelake is a good chip and a clear improvement over both Skylake-X and Kabylake. It’s not a massive leap, but it’s a generation of products that appears to be solidly better than the last. It has extend Intel’s lead in the areas where they were beating AMD and largely closed the gaps in the areas that they weren’t. The only issue with Coffeelake is the chipset situation. The delayed rollout of the rest of the Coffeelake platform should give early adopters a reason to take pause. Deal hunters and the value conscious will probably want to hold on for a few months until early next year when Intel is planning on filling out its Coffee Lake product stack and motherboards with the cheaper chipsets will arrive.